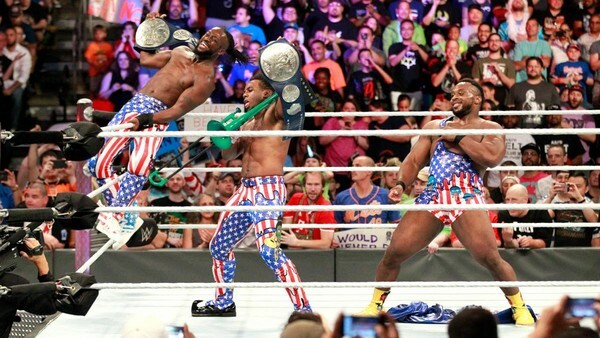 Seven months removed from the end of their record-breaking run as Raw Tag Team Champions, The New Day finally have WWE gold around their waists again. The group's Kofi Kingston and Xavier Woods defeated The Usos at last night's Battleground pay-per-view in Philadelphia, becoming SmackDown Tag Team Champions in the process. Though the tag teams competed in the opening bout, their clash has emerged as Battleground's consensus 'Match Of The Night.' Their previous contest at Money In The Bank ended with The Usos retaining via deliberate countout, but there were no such issues here, and Woods put Jimmy away with a ropewalk elbow drop following an exciting series of near-falls. This is The New Day's first reign as SmackDown Tag Champions since joining the blue brand as part of April's Superstar Shake-Up, and the third time they've held gold in WWE. 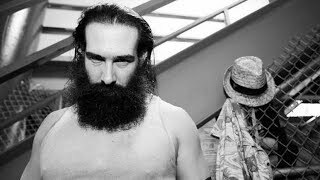 At 483 days, their last run was the longest in WWE history, having surpassed Demolition's longstanding record in December 2016. This win also makes them the first team to hold both the Raw and SmackDown Tag Titles.